Thanks to specialization in cutting-edge diagnostic technology, such as the three-dimensional (3-D) echocardiogram, the Hadassah Medical Center’s Heart Institute is saving more lives through subtle monitoring of heart functioning. The echocardiogram, a mainstay of cardiac diagnosis, uses sound waves to construct a picture of the heart in motion, giving vast quantities of information about the structure and functioning of the heart. Advanced echocardiographic technologies provide three-dimensional views of adults, children, and even a fetus. They enable Hadassah’s physicians to quantify subtle changes in heart rhythms and contractions. For example, Hadassah is a leader in the development of speckle-tracking, which measures the motion of speckles within the heart, allowing for calculation and detailed measurement of the regional deformation of the heart during contraction and relaxation. Because of scattering, reflection, and interference of the ultrasound beam in myocardial tissue, speckles appear in grey scale two-dimensional (2-D) echographic images and can be tracked from frame to frame throughout the cardiac cycle. The Hadassah Medical Center also specializes in complex stress studies, often performed on high-risk patients with significant heart problems to determine whether surgery is the appropriate option for them. Hadassah’s cardiac experts perform state-of-the-art, rapid-acquisition gated CT scans where images are recorded at specific intervals during the cardiac cycle. They are then processed to form a 3-D data set that can be manipulated in 3 dimensions. By magnifying the images of the vessels, physicians can accurately detect narrowing and blockages in the arteries. 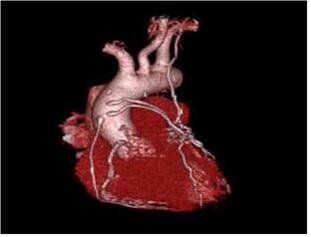 For some patients, a cardiac CT can eliminate the need for an invasive coronary angiogram. Pediatric cardiac Magnetic Resonance Imaging (MRI) is another specialty of Hadassah’s Heart Institute. Cooperation between Hadassah’s pediatric cardiac team and radiologists creates three-dimensional images of complex heart defects, enabling physicians to assess heart function despite the unusual anatomy. MRIs are able to provide very high-resolution images using the movement of electrons exposed to high-power magnets. These images provide valuable information following intricate surgical repairs.